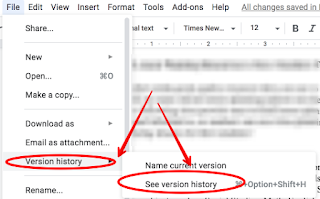 One of the best features that mark Google Docs as a powerful collaborative writing platform is the ‘revision history’. 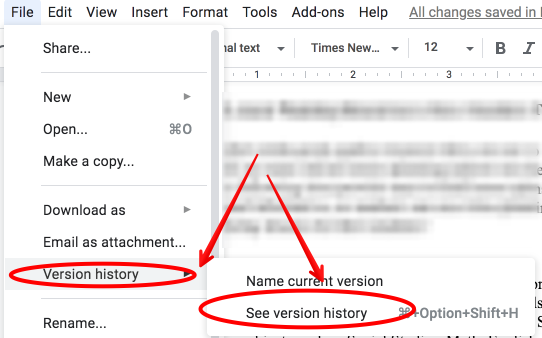 Using ‘revision history’ allows you to see all the changes you or others working with you on the same document have made. All portions of text that have been added to the document are highlighted in a different colour. Omitted text is displayed with a strikethrough. Another interesting collaborative feature from Google Docs is called ‘See new changes’. This is particularly useful for co-writing documents. When working on a document with other collaborators, you will be able to see the changes added to the document as soon as you open it. When there are new changes to the doc a blue button reading ‘see new changes’ will be displayed next to the Help menu. You can also access this new feature by clicking on File and selecting ’See new changes’. As is the case with ‘revision history’, added text is highlighted in a different colour and deleted text is marked with a strikethrough. To see the revision history while viewing the new changes, click 'See full history' in the top right. Check out Google Docs Help page to learn more.